Getting plenty of the sun, sand and sea is part and parcel of your stay at Villa Anar. Set in a prime beachfront location, the villa offers direct beach access and uninterrupted ocean views. Five bedrooms and spacious communal areas are spread out across an extensive property, creating a set-up ideal for accommodating groups of 10. Impeccable service from an on-site team completes your stay. 10 guests are comfortably accommodated in five bedrooms. 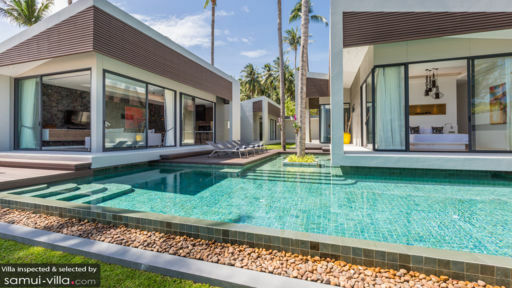 While double beds, quality linen, blockout curtains, air conditioned interiors and private en suites are common across all bedrooms, the master bedroom stands out with features like a large terrazzo bath, ocean views and direct pool access. A large turquoise pool, complete with water features, a jacuzzi and shallow wading area takes centerstage outdoors. An outdoor deck equipped with sun recliners frames the pool, providing vacationers with ample space to kick back and unwind with sundowners. The well-manicured lawn stretches out towards the beachfront; along the edge of the lawn lies a daybed and massage sala. Floor-to-ceiling glass sliding doors flank the living spaces of Villa Anar to create bright, airy interiors. Take in unobstructed panoramas of the ocean as you sink into the plump couches in an indoor lounge outfitted with a flat screen TV, colourful throw cushions and state of the art sound system. The lounge extends out towards a dining setting featuring a large teak table and an open kitchen. The latter is outfitted with a breakfast bar counter, wine cooler, table top hob, oven, fridge, dishwasher and coffee machine. 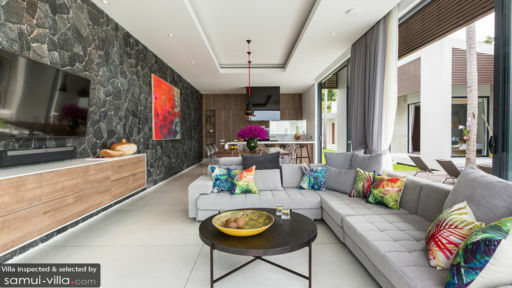 The decor style is best described and stylish and contemporary, and throughout the home you’ll find a selection of carefully chosen ornaments, bespoke prints and Jim Thompson fabrics. Villa Anar enjoys impeccable service. A villa manager will assist with all your vacation needs, while a guest relations manager will make a visit after your check-in to help with travel and tour arrangements. Daily breakfasts, airport transfer and housekeeping services are included with your stay. Villa Anar also offers a shopping service at additional cost. You’ll be asked to fill up a food and wine shopping list, and the staff will proceed to stock up the villa with the required items before your arrival. Villa Anur enjoys a tucked-away setting along a quiet beach. It’s within walking distance to the main stretch of Bang Po Beach, a scenic coast ideal for long walks accompanied by views out to Koh Phangan. You’ll find a good selection of seafood restaurants at the western end of the beach. The town of Nathon is about 10 minutes’ drive from your villa. Peppered across the town are seafood restaurants, a supermarket, walking street (it’s held at the main ferry pier) and cafes. Stop by Nikki Beach Club for a decadent weekend brunch and Hippocampe French Bakery for homemade bread and pastries. Speedboats depart from Nathon Pier to Ang Thong Marine Park, a popular offshore destination known for its picture-perfect scenery, snorkeling and diving. 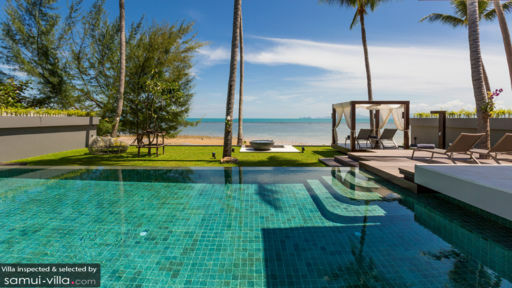 Samui’s must-see attractions are located within 30 minutes’ to an hour’s drive from your villa. We recommend visiting iconic cultural sites like the Big Buddha and Wat Plai Laem, and make a stop by at Lad Koh Viewpoint to take in the spectacular coastal scenery. Bophut Fisherman’s Village, located 20 minutes’ drive away is a family-friendly venue that offers with excellent dining and shopping haunts.